A.J. 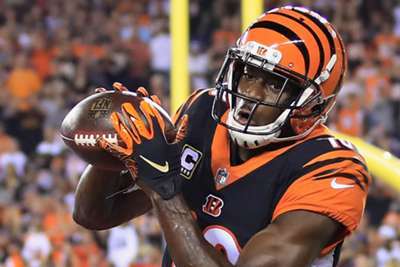 Green and the Cincinnati Bengals outpaced the Baltimore Ravens in a 34-23 victory in the first matchup between AFC North division rivals this season. Cincinnati used a 14-point first quarter to take a lead they would never relinquish. Andy Dalton attributed the win to a strong start, but it was also a strong performance the Bengals quarterback and company kept up through the next three quarters that put the Ravens' comeback to bed. In what usually is a close game, Bengals wide receiver Green made sure Cincinnati enjoyed a cozy lead after scoring three touchdowns in the first 17 minutes. Dalton first found Green for a short four-yard touchdown to open the first quarter. The Bengals scored on the next three drives with Green responsible for two more touchdowns – a 32-yarder and another short score from the red zone. It's an @ajgreen_18 HAT TRICK! A series of plays before half-time cut Baltimore's deficit in half. The Ravens finally got on the board in the second quarter when Javorius Allen rushed for a one-yard touchdown. The Bengals answered with a score and on the next play, Baltimore turned it over on downs. If Cincinnati ran the clock out, it would have went into the break with a more comfortable lead but a three-and-out gave the Ravens a chance to put more points up – and they did with another touchdown with just eight seconds left in the half. Again, Joe Flacco tried to will Baltimore back into the game with a late drive, a 21-yard touchdown pass to John Brown. Flacco is at the helm of the Ravens, but the future is with number eight Lamar Jackson, who Baltimore hope will take over under center in the not-so-distant future. Fortunately for Flacco, that did not happen on Thursday.